Hapoel Rishon Le-Zion (D1) agreed terms with 27-year old Nigerian international power forward Atonye Nyingifa (180-90, college: UCLA) from Elitzur Holon. In 24 D1 games in Israel she had 18.4ppg, 10.4rpg, 2.5apg and 2.6spg (in top 3) last season. She helped them to make it to the cup final and to the league semifinals. The previous (2016) summer Nyingifa played at Atenienses in Puerto Rican BSNF where in 8 games she recorded also remarkable stats: 16.0ppg, 8.6rpg and 1.8apg in 2016 season. The list of the past achievements is quite long as among others she was voted Eurobasket.com Israeli League All-Imports Team in 2016. Nyingifa has been regularly called to Nigerian Senior National Team since 2016. She has played previously for another Israeli team Hap.Petah Tikva. 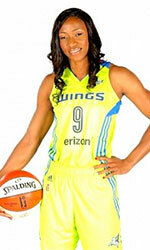 Nyingifa attended Univ.of Calif.at Los Angeles until 2014 and it will be her fourth season as a professional player.